While currently the weather doesn't warrant the use of sunglasses, the time spent in the North and East of Finland skiing did, and I am hopeful that soon we will have wonderful sunny weather again. So sunny, that one needs sunglasses! My sunglasses of choice for outdoor activities are the Julbo Dolgan shades, made in France. Weighing in at 33 g including the necklace thingy, that is an acceptable weight for me. 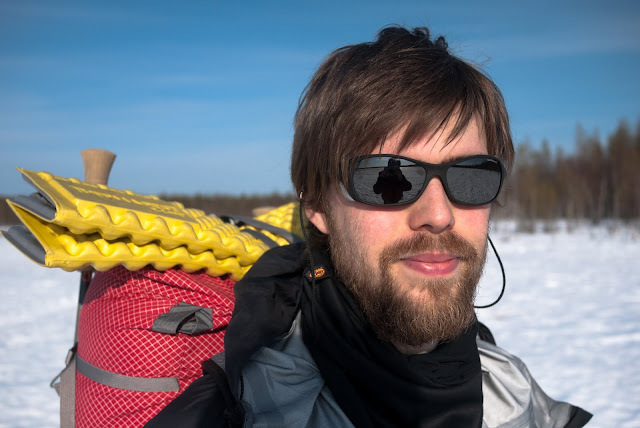 While there are lighter glasses around, for something that gets used so much and might collect its fair share of scratches from bushwacking & spending time in a meshpocket with other stuff, I believe a good, affordable pair is a better investment than a 200€ pair of shades where every scratch hurts. I have the Spectron 4 lenses, which claim to be "Light but with excellent shock resistance" and have an anti-reflective coating which "improves visual comfort by eliminating stray reflections" and a flash finish: "improves visible light filtering with mirror effect lenses; it reflects the rays of light and increases the filter effect and eliminates the radiation reflected by the outer mirrored surface of the lens." Woohoo. Translated into plain English that means they do their utmost to keep those dangerous UV rays out of your retinas, also keep out the glare from snow & water, and allows you to shoot laser beams at ultraheavy backpackers. OK, I made that last one up, but that would be a cool feature. It also said that it has an anti-fog coating. Well, somehow those never seem to work for me. Put the lenses on your head to check something with clear sight, put them back on, and they give me this lovely foggy view. At least the fog doesn't stay long, even if I do an activity like skiing which lets me perspire a lot. So it is cool and I learn to live with it. The lenses have a sweet, slightly orange tint to them, which is great in white winter landscapes as well as in green summer forests. Also when packrafting I found them an adequate protection for my eyes, while being able to pick out details in the stream ahead. The outside of the lenses have a mirror finish, this allows me to stare without worries at the ultraheavy food of other campers without being afraid that they notice it (unless I am also drooling). On a more practical note, it allows me to check my face for scratches or if my hair-do is fine when re-entering civilization. 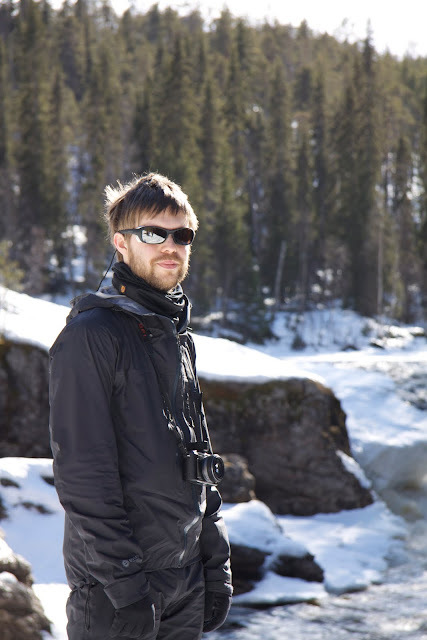 The sunglasses keep snow and wind out very well thanks to the ergonomic design and "removable" wings at the side. I tried once to remove them, but didn't want to exert too much force and hence gave up. Taken off, they might save a gram or six together, I guess. But I rather am protected from snow and wind, to be honest. The necklace thingy (Weight: 1 g) makes me look like a 70+ year old grandmother and likely to lose my glasses, but the truth is that sometimes it is more convenient to have them hang around your neck than have the shades riding on top of your skull. Like when you have a sweaty head or big wooly hat on top. Hitching a ride on top. Bottom line? A cool looking pair of shades which are functional and light. If Nemo could have chosen his own sunglasses instead of getting a hand-me-down pair from Morpheus, he would have taken these. You can get them at your own free will from Parttioaitta in Finland, or check the Julbo Europe / Julbo USA site for a retailer near you.